Last year, more than 50 percent of U.S. companies sold products and services outside of the U.S. In 2015, reaching 90 percent of the online audience worldwide requires localization into more than 25 languages. To reach the same proportion of web surfers in 2020, you will need 48 languages, according to data from Common Sense Advisory. The top 8 multilingual unicorns are all U.S. companies. Which languages should a startup target first? Based on what our unicorns did, startups should start with English, followed by French, German, and Japanese. Chinese is only 10th on the list of targeted languages (chart below). Why is Chinese localization so unpopular, relative to the immense size of the Chinese market? One explanation is the Great Chinese Firewall and users’ preference for indigenous platforms. In China, Facebook, Twitter and other Western mainstays are either completely absent or bypassed in favor of homegrown products. These competitors include Baidu, Weibo, Sina.com, and others. So simply localizing your product may not guarantee success if it does not fit with the habits of your target audience. U.S. unicorns average 9.4 languages and Asian unicorns average just 2.3 languages. 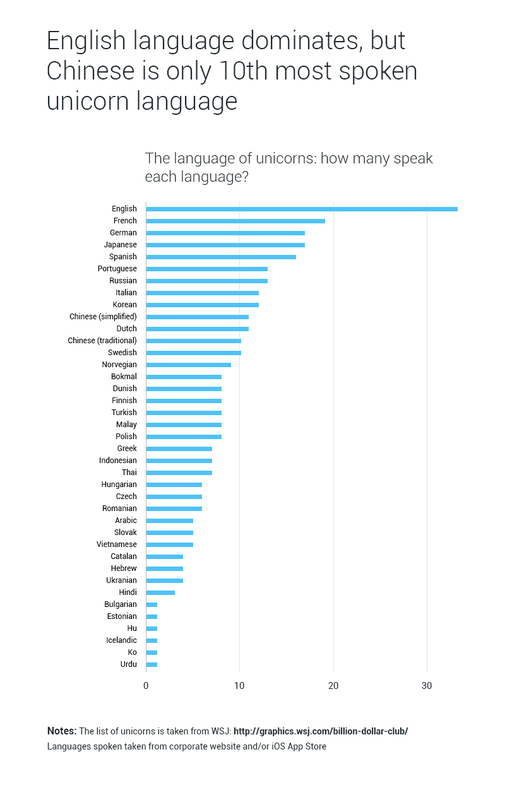 Surprisingly, U.S. unicorns on average speak more Asian languages. This is because Asian unicorns average only 1.3 Asian languages. What’s more, U.S. unicorns speak way more languages than their Asian counterparts. We believe that Asian unicorns will move to close this gap by introducing their applications and products in more languages. The Chinese government (not unlike the governments of other countries) seeks to reduce dependence on foreign platforms and has committed to supporting local coders. Combining this domestic “core” with growth on foreign markets offers a tempting opportunity. However, localization is a necessary-but-not-sufficient condition for growing internationally. Even if Asian unicorns offer their products in more languages, will they actually gain market share? Are their products truly compelling, or just “fast followers” with little to add? Localization is only one part of the process for delivering new and unexpected value to users.